BMW said Tuesday it would build the hood and fenders of its next-generation 2019 3 Series out of aluminum, the latest popular vehicle to adopt a mixed-material strategy. The OEM said it cut 44 pounds out of the body-in-white, mentioning “increased use of high-strength steels” over the sixth-generation 2012 edition — which itself had been lightweighted and engineered with “high and ultra-high tensile steels, a hot-stamped B-pillar, plastics and state-of the-art composites.” So collision repairers are definitely going to want to pay close attention to the new body and BMW’s repair procedures for it. Switching the hood and fenders to aluminum allowed BMW to cut nearly 33 pounds more out of the car, and adopting aluminum for the engine subframe and front spring struts saved another 16.5 pounds. The 2012 3 Series had aluminum torque struts, swivel bearings and wishbones, according to BMW. 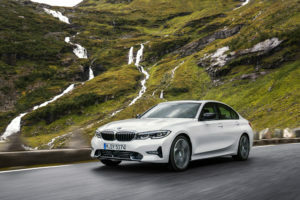 “Aluminum swivel bearings and control arms for the front axle, aluminum wheel mounts and a new generation of wheel bearings for the rear axle significantly reduce unsprung mass,” BMW wrote of the 2019 successor. The increased use of aluminum on what appears to be an otherwise steel vehicle is another indication that shops probably won’t be able to avoid having dedicated space and tools for handling aluminum. 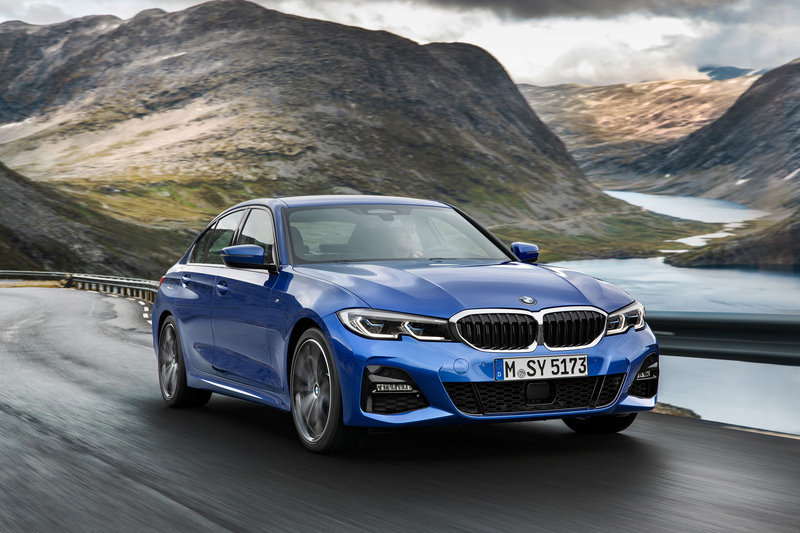 The 3 Series is BMW’s top seller, with 59,449 units in 2017, and anyone desiring a piece of cosmetic or structural work for the car is going to need to be prepared to properly handle the metal. 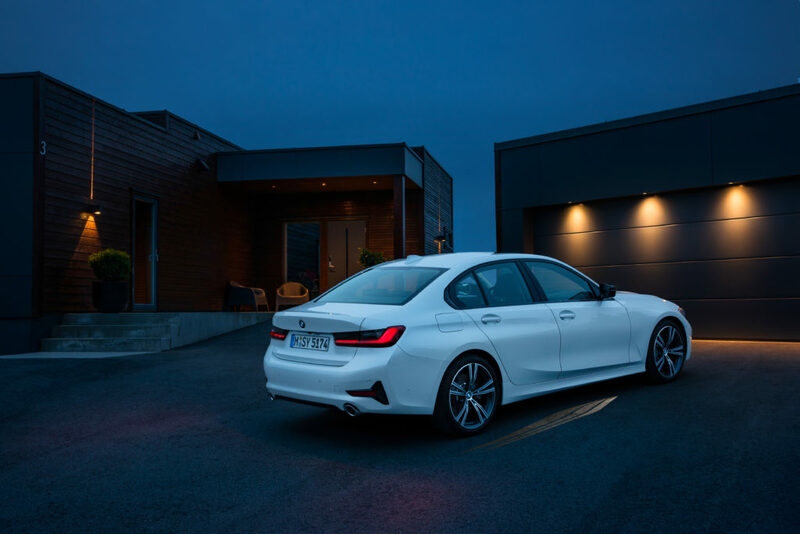 The OEM wrote that it also achieved a perfect 50:50 weight distribution again, a quality found in the previous generation of 3 Series. It’ll be crucial for shops to deliver the kind of precision BMW demands to restore that vehicle balance. BMW also increased the rigidity of the body as much as 50 percent in some areas, the OEM noted. The car will go on sale in March 2019 with the $40,250 330i and the $42,250 all-wheel drive 330i xDrive. LED headlights and taillights are standard, but customers can upgrade to headlights “with extended features and U-shaped daytime driving lights” as well as an optional set of “Adaptive LED headlights with BMW Laserlight” lamps. The latter are able to adjust to the road path you’re driving. Automatic high beams are also an option. An optional feature also rolls out the “Welcome Light Carpet,” which “illuminates the approach to the doors when they are unlocked using the central locking or a door is opened,” according to BMW. There’s an “eye-catching notch in the front bumper that rises up into the headlight contour” and highlights the BMW kidney grille, according to BMW. Above it can be found a hood with four contour lines with a leading edge that “sits flush with the upper edge of the headlights and kidney grill,” BMW wrote. Getting these two design elements precisely where BMW wants could be crucial to the pre-loss appearance of the vehicle. Even the windshield wipers are fancy. “The wiper arms with integral spray nozzles specially developed for the new BMW 3 Series Sedan allow the washer fluid to be distributed in a very even manner, ensuring it does not impair the view through the windscreen at whatever speed the car is travelling,” BMW wrote. Character lines run from the fenders back through the handles and back to the quarter panel. Ten metallic shades and two non-metallic colors are available from the start. A glass roof is optional. The optional head-up display returns 70 percent larger and now integrates a distance warning related to the adaptive cruise control system. Learn more about OEM procedures and tech during the SEMA show in Las Vegas at “The Rules – and Challenges – of Structural Repair on Modern Architecture” with Dan Black of FCA, Robert Hiser of the Auto/Steel Partnership, Shawn Hart of Audi and Mike Kukavica of Porsche; “Understanding Shop Liability in this new Era of Diagnostics, Calibrations and Programming” with Michael Quinn and Chuck Olsen of AirPro; “The Imperative of Accessing and Retaining OEM Repair Information on every Structurally Repaired Vehicle” with Pete Tagliapietra and Wil Peck of NuGen IT; and “The importance of ADAS system resets when performing wheel alignments during the collision repair process” with John Shewbridge of Hunter. The sessions are part of the Society of Collision Repair Specialists’ Repairer Driven Education Series Oct. 29-Nov. 2. Register here for individual RDE classes or the series pass package deal. • BMW’s adaptive cruise control, which works between 0-130 mph and can brake the car if needed, now can track “not only the vehicle immediately ahead, but the one in front of that as well,” according to BMW. • Autobraking with pedestrian and bicycle detection is standard. Rear collision protection and cross-traffic alert — the latter which BMW notes uses the radar sensors in the bumper fascia — are optional, as are lane keeping and blind spot monitoring. • Driving Assistant Professional, which appears to be BMW’s version of Tesla’s Autopilot, also is available as an option. It relies upon technology like a “trifocal camera co-developed with Mobileye, working in conjunction with a front facing radar” and various ADAS systems to steer the car, keep the lane, avoid hitting the car in front of you, and avoid side collisions. It also has evasion assistance, which according to Business Insider can swerve the car to avoid obstacles like pedestrians and rear traffic. It’s unclear if you have to keep your hands on the wheel for this one. However, you won’t need to do so when a similar lower-speed traffic system known as Extended Traffic Jam Assistant is active. (It’s only supposed to work on “limited access highways” at “up to 37 mph,” but it’s unclear if BMW will actually block it in other situations.) The vehicle will keep an eye on the driver with a camera, and so long as their attention “is clearly on the road ahead,” BMW won’t make the motorist keep touching the steering wheel. • BMW offers optional park distance alerts or an upgrade in the form of an optional autoparking system able to get the car into a parallel or regular parking space — and exit a parallel parking space itself. The car also has what BMW calls a segment-leading “Back-Up Assistant,” which remembers how you entered a tight space and can back the car out automatically following the same path.